On April 27th, Roger and I hopped in my parents' car at 4am and headed down to Maryland for my good friend Sarah's bridal shower. We planned to split the drive down, but when I switched into the driver's seat, my back really started to bother me and we had to switch back at a rest area about an hour later. We arrived in Potomac (the town where Sarah's fiancé grew up) without hitting any real traffic, and I dropped Roger off at a subway stop so he could head into DC to see an exhibit at the National Museum of African Art and settle things with the AirBnB we'd rented for the night. I proceeded to the shower without too much pain, and had a really nice time celebrating Sarah and her upcoming marriage. A few friends from Sarah Lawrence were there, and it was great to see them, too. Sarah looked so beautiful and I know that all the gifts we gave her will be put to good use; she throws the best parties! After the shower, I headed east to Annapolis, where the fabulous Carlea lives. After stopping by her house to change and say hello to her mother, she took me on a walking tour of town on the bay. It was a really gorgeous day and we wandered down the main drag to the bay itself, where they were having a boat show. We stopped for ice cream at Storm Brothers Ice Cream, which was the perfect mid-walk treat. The buildings around town are really beautiful, and Carlea knew a good bit of history about a few of the houses. It was so great to see her, and I'd definitely recommend stopping in Annapolis if you're ever in the area - it was lovely. I drove down to DC and met up with Roger at the AirBnB, which was actually a fantastic choice. We stayed right in Capitol Hill and the price was much more affordable than hotels in the area. Roger and I had dinner at Dukem, where we split one of the deluxe vegetarian platters and Dukem lamb, which was really delicious. It was a huge portion and the prices were right, so I would definitely recommend it. The next morning, we eschewed our favorite doughnuts for a walk to Eastern Market, where we sampled empanadas, perused antiques, and bought Roger a few dress shirts. After that, we headed back to the car and up toward New York. The trip was too short, but we had a blast and I hope we can make it back down to DC again someday soon! 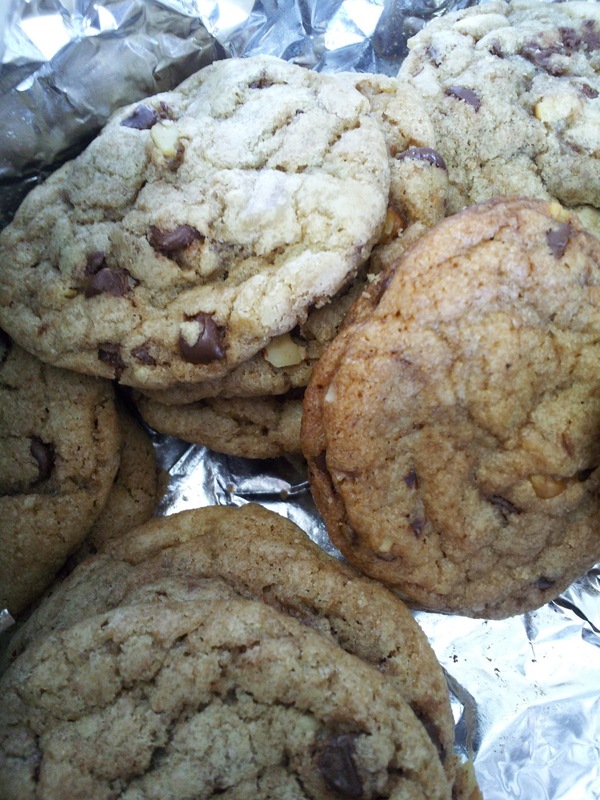 You may not know that today is National Chocolate Chip Cookie Day, but it is! To celebrate, last night (at 10pm, brilliant) I decided to make a batch to split for my office and Roger's office. I really love the Tollhouse recipe, but I've had really good luck with Cook's Illustrated in the past, so I decided to try their Ultimate Chocolate Chip Cookies this time. They turned out really well (very flavorful, though perhaps a little thinner than I'd like), and are still soft today. Adjust oven rack to middle position and heat oven to 375 degrees. Line 2 baking sheets with parchment paper or aluminum foil. Whisk flour and baking soda together in medium bowl; set aside. Melt 10 tablespoons butter in 10-inch skillet over medium-high heat. Continue cooking, swirling pan constantly, until butter is dark golden brown and has nutty aroma, 1 to 3 minutes. Transfer browned butter to large heatproof bowl. Add remaining 4 tablespoons butter and stir until completely melted. Add brown sugar, granulated sugar, salt, and vanilla to melted butter; whisk until fully incorporated. Add egg and egg yolk; whisk until mixture is smooth with no sugar lumps remaining, about 30 seconds. Let mixture stand for 3 minutes, then whisk for 30 seconds. Repeat process of resting and whisking 2 more times until mixture is thick, smooth, and shiny. Using rubber spatula, stir in flour mixture until just combined, about 1 minute. Stir in chocolate chips and nuts, if using. Give dough final stir to ensure that no flour pockets remain and ingredients are evenly distributed. Working with 3 tablespoons of dough at a time, roll into balls and place 2 inches apart on prepared baking sheets. Bake 1 sheet at a time until cookies are golden brown and still puffy and edges have begun to set but centers are still soft, 10 to 14 minutes, rotating baking sheet halfway through baking. Transfer baking sheet to wire rack; let cookies cool to room temperature. I'm not the world's biggest baseball fan, but my mother and sister were die-hard Yankees fans when I was growing up, so I can appreciate a good game and usually go at least once a season. So, when my friend Alana called and said she had two tickets for yesterday's game, we dropped everything and ran up to 161st St. where the Yanks were playing the Oakland Athletics. We got there at the start of the second inning, grabbed some Johnny Rocket's for lunch, and watched what felt like one of the fastest games I've ever seen. We had a real blast, so thanks so much, Alana, for thinking of us! We found this picture hilarious. People on instagram were less appreciative. Sorry to leave you hanging there for a while! My back's been doing much better, thanks to the above exercises (and a few more, and a great doctor, and a great PT). In case you're interested in the official diagnosis (not really sure why you would be, but...) is three mild disc herniations in my lower back, caused by a degeneration (and in one, a small tear) in my cartilage. The three are touching my spinal cord, which caused the pain, and one was touching a nerve, which also caused pain. With the pain came swelling in the back muscles, which pulled the discs even further out of place. I also have some very small cartilage protrusions in my middle back and mild scoliosis, which aren't causing any problems yet, but which we're trying to take care of in physical therapy. I'm still not allowed to run, but things are feeling a lot better (when I don't count how sore I am from all these different exercises!) and so I'm hopeful I'll still be able to get back on track soon. In the meantime, things have been going well, and I hope to blog soon about what we've been up to. I threw a surprise party for Roger on April 13th, we went to DC for a bridal shower last weekend, and I'm almost officially an MFA. Classes end next week and my graduation is in just 20 days. Needless to say, it's been a whirlwind few weeks, and I can't wait to tell you more about each of those soon. For now, though, this quick check-in will have to suffice!